Why do prospects join my business? Learn the real reason prospects join … in less than three minutes! Check out the audio here! What I wish they’d taught me in high school. I graduated high school with no money skills. I wish one teacher would have taken the time to give the class a 10-minute lesson on money. That’s all it would take. Managing money to create wealth is not rocket science. 1. Buy stuff that goes up in value instead of down in value. What goes up in value? Investments in land, securities, our home. What goes down in value? Cars, costume jewelry, concert tickets, eating out. 2. Avoid debt. Debt is rewarding ourselves with things we have not saved for. What sounds better? Working hard and giving our salary to someone else to pay our debt? Or, having other people work hard and give their salary to us … to pay their debt to us? 3. Keep overheads low. A less expensive apartment and car means we have more money to buy stuff that goes up in value. 4. Invest in ourselves. We can double our income for the same amount of hours worked, if we learn good skills. That’s it. In 10 minutes, teachers could change their students’ lives. 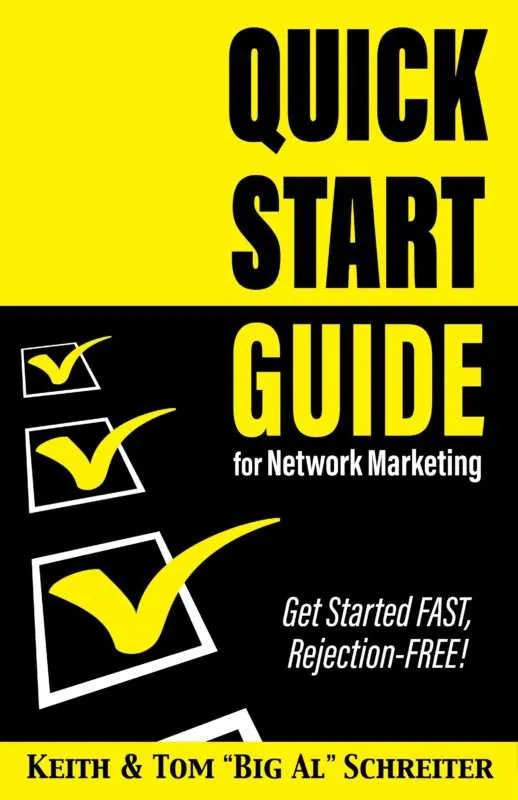 Many of you have read, “26 Instant Marketing Ideas To Build Your Network Marketing Business.” The first chapter is about “sound bites.” Once you realize the power they have over prospects, you will start building your collection of “sound bites” as fast as you can. If you click on the Amazon button, it will take you to the book’s Amazon page where you can access the free preview by clicking on “Look Inside” on the book’s cover. See what great “sound bites” you can use to build your business faster. Once you understand this, it gets easier. In every workshop, I stress that success is not in “finding” the right prospects, success is saying the “right words” to prospects. You can find thousands of great prospects, and ruin them all, by using the wrong phrases and words. You can say the right words, and neutral people become hot prospects. So here is a short two-minute video that proves that we should stop looking for good people, but instead, learn what to say. You’ll love it. How to take iron-fisted control of your prospects’ minds. Prospects are reactionary. Most of their decisions are simple reactions to what we say and do. I walk outside into the parking lot, and I give a stranger $100. Will the stranger react? Now, imagine that I walk outside into the parking lot, I meet the exact same stranger, but this time I do not give him $100. This time, I give him a punch in the nose. Did the behavior of the stranger have anything to do with the stranger? Or, did the behavior of the stranger have everything to do with what I said or did? If we don’t like the behavior of our prospects, all we have to do is change what we say and do. They will react to us. That means sponsoring and selling is within our control. So stop blaming prospects. Instead, let’s learn what we can say and do to get them to say “yes” when we talk to them. 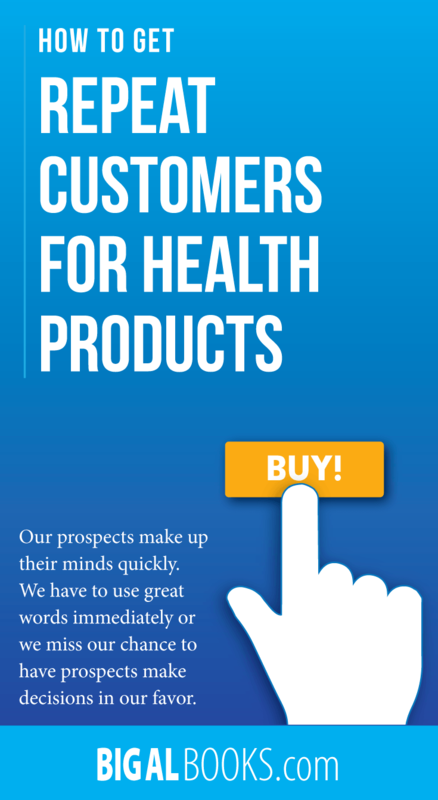 How to get repeat customers for health products. Prospects don’t buy from boring salespeople. We have pantothenic acid in our vitamins. Our scientist can beat up your scientist. We have pharmaceutical-grade quality control. Our unique, patented, registered, proprietary formula. Our organic, natural, supernatural ingredients. If prospects don’t buy from boring salespeople and boring facts, what triggers their minds to make decisions to buy? Good question. Prospects don’t pay attention. They have other things on their mind. All they generally hear from us are glimpses into our conversation. Their minds want to focus on something more pleasant than listening to a salesperson trying to sell them something. One thing that will penetrate this lack of attention is using interesting word phrases. So instead of talking on and on about antioxidants, vital nutrients, blood sugar balance, etc, we should focus our attention on key phrases that our prospects will actually hear. Over time, we will learn better words that help us sell health products. Better words motivate people to join, and to continue using our health products. There are two places where words will make a huge difference. #1. At the time of sale. #2. Words that we can use in our conversation BEFORE we give our sales presentation. But, we can get better. What if we could alter the mindsets of our prospects? Instead of them perceiving us as a salesperson, they perceive us as a problem-solver? How do we change our prospects’ mindsets? By changing our mindset. Prospects are reactive. The programs in the back of their minds simply react to our current mindset. If we change their mindsets, we will instantly change our results. You can read the four mindset changes for free. Learn how to position your retail sales so people are happy to buy. Don’t know where to find customers for your products and services? Learn how to market to people who want what you offer. Our prospects make up their minds quickly. We have to use great words immediately or we miss our chance to have prospects make decisions in our favor. It is the same situation for sponsoring new team members. Using magic words and phrases early in our conversations is better than giving a great presentation. The decision is made before our presentations begin. Want more words and phrases to get new team members? Simply enter your email address and we’ll send you the link to download two FREE audios “Magic Words for Prospecting”. We can make our careers easier if we recognize that our prospects want to make a decision immediately because they have limited time. They have other things they want to put their attention to. What are some good first sentences? We only get one chance to make a good first impression. Our opening sentence is everything. Our prospect has already started making the final decision within seconds of us starting our presentation. We need to learn how to manage this. 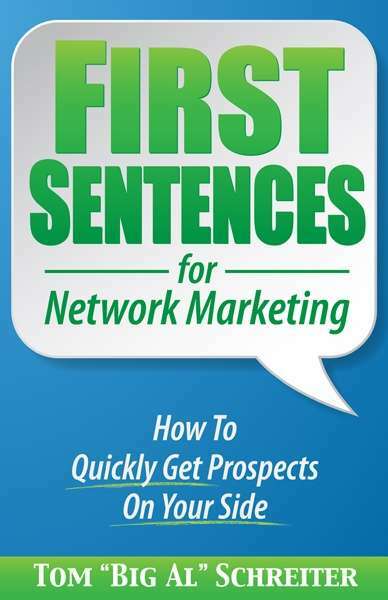 Attract more prospects and give more presentations with great first sentences that work. How to get repeat customers for diet products. In the early 1970s, I was selling vitamins. Nobody wanted vitamins. The idea was too new. But fortunately we still had fat people back then. Many people wanted to lose weight. I thought, “If I can’t sell vitamins, maybe I can reposition them as diet products?” But the idea of diet products was still too new also. So, I created an alternate plan. I created my first diet club. Now, this wasn’t an ordinary diet club. I had no budget. I had no location. So here is how I did it. I explained how the diet club could help the attendees, but that it would be more of a social event. This made it easy to get six members immediately. People love being social. For the first meeting, I brought a scale. Everyone weighed in so that we had a starting weight for each member. That took about 15 seconds for each person to weigh in. I explained how we would have a winner each week. Of course, that would be the person who lost the most weight that week. Next, I would explain how an exercise would look if they decided to try one. This amused them while they drank their coffee and ate cupcakes. Then, we proceeded to eat the treats everyone brought. Easy first session. The next week, we had the weigh-in. I awarded a “traveling trophy” to the winner who lost almost half a pound. (Some weeks I had to award the trophy to the person who gained the least.) Now, this created competition among the members. They created new ways to cheat almost every week. Some weeks they would wear heavy clothes and big boots so that the following week they could be the winner when they wore only light clothes. Because this was a “traveling trophy,” I only had to buy one trophy. The trophy was passed on to the new winner each week. But, the ladies got even more creative. Because they were friends, they enjoyed teasing each other. The loser for the week had to put a poster on their refrigerator for the week. The poster was of a rather large person bending over, looking into a refrigerator. Since they were friends, they would go and check the loser’s refrigerator during the week. All in great fun. Every week I would spend one or two minutes describing an exercise or a tip about proper eating, ate lots of yummy desserts, and took orders for vitamins. Then we would break to try the different desserts everyone brought. The members appreciated my efforts and rewarded me by purchasing vitamins regularly. Maybe in the back of their minds they thought the vitamins might give them an edge over their friends. So each week I delivered plenty of vitamins at the diet club. Did anyone lose weight? Not really. They happily told their husbands they were going to a weekly diet club. However, I am sure many of them became healthier by taking vitamins regularly. This was so easy. Participants loved the weekly meetings and loved the new desserts everyone brought. This diet club became so popular, I was forced to open several more. These were the easiest retail sales I ever made. I showed up with a scale, gave a diet tip, ate lots of yummy desserts, and took retail orders for vitamins. I gained a lot of weight running these diet clubs. Over time, I learned to say better words at the diet clubs. Better words motivate people to join, and to continue on diet products. “Turned my body into a fat-burning machine.” These words will stick in our prospects’ minds later during our presentation. These words are hard to forget. They imagine burning their excess fat while watching television. “Nobody wants cottage-cheese thighs.” When we say these words, our prospects feel motivated to avoid that picture in their minds of dimpled thighs. “Rabbit food is for … rabbits. We want real food.” Our prospects are thinking of their favorite subject … food. They realize we understand their passion for eating and this creates trust and rapport. What if we could alter the mindsets of our prospects? Instead of them perceiving us as a salesperson, they perceived us as a problem-solver? How do we change our prospects’ mindsets? By changing our mindset. Prospects are reactive. The programs in the back of their minds simply react to our current mindset. If we change their mindsets, we will instantly change our results. They are in the free Amazon preview of the latest “Big Al” book. Just click on “Look Inside” on the book image. Enjoy the great ways to get team members to have fun retailing their products and services. Asking questions is a good way to get your prospects thinking. You can make your prospects stop, think, and really consider your offer if you ask interesting, heart-stopping questions. For example, here are two ways to ask questions. Which way do you think will get the best results? A. How do you see your financial future? B. Will your boss give you a raise next year? A. What is your weight management goal? B. Do you want to lose 15 lbs. before your class reunion? A. Want to save $3.16 on your next long distance telephone bill? B. Are you tired of your phone company ripping you off? You see, it is how you ask that makes a difference. How to sell skincare and cosmetics quickly. When is the best time to know what to say to a great prospect? #1. After we meet that prospect? #2. Or, before we meet that prospect? If we want to sell cosmetics and skincare, and get new customers, what we say will make a huge difference. Obviously the second headline will work better and attract more buyers. It is the same when we talk to people about our skincare and cosmetic products. * “I did not want to be one wrinkle away from a prune.” These words will stick in our prospects’ minds later during our presentation. These words are hard to forget. * “I never wanted my face to look older than I was.” When we say these words, our prospects picture themselves saying the same thing. * “Well, you know how cheap makeup makes us look … cheap.” Because we use the “Well, you know how …” opening, our prospects easily accept this as a fact. ==> But, we can do better. What if we could alter the mindsets of our prospects? Instead of them perceiving us as a salesperson, what if they perceived us as a problem-solver? They are in the free Amazon preview of the latest “Big Al” book. Go to Amazon with the link below and just click on the “Look Inside” on the book image. Enjoy the great ways to get team members to have fun retailing their products and services. 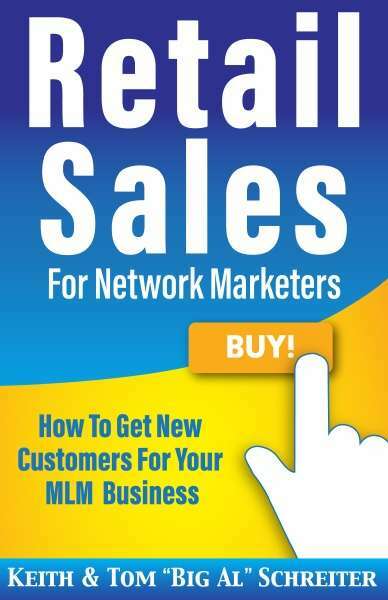 What are the top 100 MLM and network marketing companies?